Doc Pellegrino in a bad rug with his son Frank at Kingston Mines in 2008. Note—It has taken me several days to research and create this post about Dr. Lenin Pellegrino and his equally legendary Kingston Mines blue club. And then a computer ate a chunk of the draft which had to be recreated from scratch. Your regular Blog service should resume. One by one over the years the icons who fostered Chicago’s unique counter cultural landscape have winked out. Slim Brundage the hobohemian founder and Janitor of the College of Complexes which preserved the radical free speech traditions of The Dill Pickle Club and Bughouse Square. Studs Terkel, the radio raconteur and oral historian who knew and interviewed everybody, including everyone on this list. Del Close, a founder of Second City, improv maven, and acting teacher whose skull fittingly became a prop for Hamlet. Richard Harding whose legendary clubs including Poor Richards and two incarnations of The Quiet Knight provided stages for local and rising national touring musicians at the dawn of their careers. 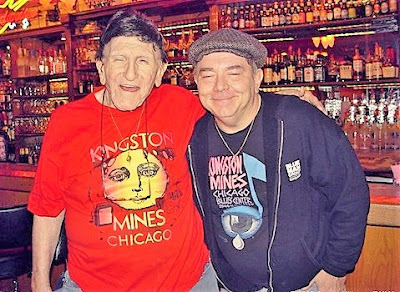 Earl Pionke, the one-of-a-kind proprietor of the Earl of Old Town and co-owner of Somebody Elses’s Troubles who nurtured the careers of the legends of the Chicago Folk Boom including Jim Post, Steve Goodman, John Pryne, Bonnie Kolak and dozens of others. 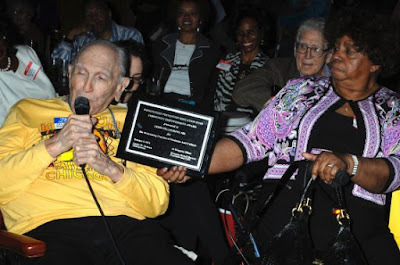 About the only survivor is Joe Segal who has been producing Jazz shows at various locations of the Jazz Showcase since 1947. None of this list of Chicago originals was more colorful than Doc Pellegrino who died at the age of 92 last Thursday and was memorialized in the Chicago Press as the long-time proprietor of the legendary blues venue Kingston Mines. His 45-year ownership of that institution alone would have qualified him to be included in their number. But there was much more to the story. You know you are a red blanket baby when your radical Italian parents record your name on your birth certificate as Lenin Pellegrino. Although friends called him Len, he proudly used the name his whole life. He was not a man to hide his Red light under a bushel. By age 19 he was a ski trooper in the U.S. Army’s crack 10th Mountain Division. He served in Italy where he was awarded a Purple Heart. After the War the GI Bill allowed Pellegrino to go to college and get his Medical Degree. And like other veterans of his generation—think Jack Kerouac and Lawrence Ferlinghetti—he became attracted to the emerging Beat scene for its defiant non-conformity, political radicalism, and connection to Black culture through jazz. When it came time for him to set up his own practice, Pellegrino eschewed setting up in the comfortable suburbs or the posher Lake Front Chicago neighborhoods where he could have made a very comfortable living. Instead he dedicated himself to the medically underserved and desperately poor Black neighborhoods on the West Side. Pellegrino lived in Oak Park, the suburb just west of Austin Boulevard. A leafy and comfortable older commuter town it was noted for its Frank Lloyd Wright homes and Unitarian Church and as the place of “broad lawns and narrow minds” where Ernest Hemmingway grew up. By the early 60’s it had a somewhat shaky reputation as a liberal haven. That reputation was challenged by the rapid racial turnover of the Chicago Austin neighborhood from the cradle of the West Side Jewish block to Black through aggressive real estate block busting. Oak Park was deeply divided between those who wanted to preserve whiteness through systematic resistance and the use of restrictive covenants like neighboring River Forest or attempt to manage change through an open housing ordinance and strict measures against block busting. Dr. Pellegrino became an early leader of the Open Housing block. As early as 1963 he was a signatory to a full page pro-open housing ad in the local paper protesting the treatment of Black families who tried to locate in the Village. He would continue to be one of the most important White civil rights advocates both in Oak Park and on the West Side for many years. Later in the ‘60’s while still heavily engaged in his open housing work, Pellegrino also added anti-Vietnam War protests to his list of activities. 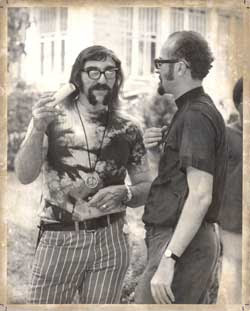 In July 1967 along with a new local chapter of Clergy and Laymen Concerned About Vietnam, he helped organize a Gentle Sunday gathering on Ridgeland Common modeled on the Be-Ins held in San Francisco and then in Chicago at The Point on the Lake in Hyde Park and then at what became known as Hippie Meadow in Lincoln Park. Dr. Lenin Pellegrino with Rev. Edward McKenna at an Oak Park open housing action. By this time Pellegrino himself was “contaminated” by hippie culture. He had grown his hair out and let his freak flag fly sporting a Fu Manchu moustache, t-shirts, bell bottoms, and beads. In the face of the local uproar he decided to give local kids a place to hang out, pick up the latest copy of the new Chicago underground paper the Seed, and get all of the essential supplies necessary for the life style—rolling papers, pipes, candles, beads, and black light posters. He opened Doc Gandalf’s, and honest-to-God head shop and coffee house on South Boulevard. The reaction was like a bomb had been thrown in the Village. There were irate neighborhood meetings and pressure put on officials to do something about the hippie scum. The place was harassed on building code violations, raided by police, and customers hassled on the street. Doc’s struggles to keep his place open for his kids were well documented in stories in the Seed. But after a few months he was forced to close up in Oak Park. Not to be defeated he and the collective corporation that ran the place relocated across the City line to the Lake Street and Austin Ave. area. Pellegrino was street smart and rented his space in a building owned by the mother of the notoriously corrupt Chicago Police Austin District Captain Mark Thanasouras figuring it would give the place a measure of protection. But the clientele, a mixture of hippies, West Side greasers, bikers, and young Black hustlers was too much for the Captain to take and soon his cops were doing the harassment instead of Oak Park’s. The Chicago undergound paper the Seed was featured prominately at Doc Gandalf's and the paper also covered the harrasment of the store at both its Oak Park and Austin locations. Worse, the establishment had drawn the attention and wrath of Police Headquarters under pressure from Daily Machine politicos. The notorious Red Squad set up surveillance and out of district Tactical Unit officers were brought in to step up busts and harassment. Once again Doc Gandalf’s was forced to close. Meanwhile the long-simmering Oak Park open housing battle was heating up again. Pellegrino was active in a project by the Citizens Committee for Human Rights, the leading organization pushing for integration in Oak Park, guided 60 Chicago area African-Americans through tour of 24 advertised homes in Oak Park and River Forest resulting in a near panic. A few months later 50 potential Black buyers or renters were paired with 50 White volunteers from the Committee to blindly test housing availability. Only three landlords or real estate brokers of 29 who responded would show to the Black buyers. All would to the identically qualified whites. It resulted in a famous press exposé and a serious embarrassment to the Village. On May 6, 1968, Oak Park passed its landmark Fair Housing Ordinance in no small part due to the long efforts by Doc. Pellegrino. Never one to rest on his laurels, Pellegrino turned his attention to providing medical service to underserved and at risk youth, the homeless, and the dispossessed. Around 1970 he became associated with the pioneering Free People’s Clinic operating in Uptown, and impoverished North Side neighborhood where Appalachian Whites, Hispanics, Native Americans, and poor Blacks mixed with a good dose of street kid run-and-throw-aways. Years later when the AIDS/HIV epidemic hit the city hard, he pitched in at the historic Howard Brown Clinic and made special outreach efforts to the especially hard hit Black community which often stigmatized Gays and drug users discouraging them from seeking treatment. It turned out that even a physician serving the poor and donating his services pro bono much of the time, till made a good living in those days. Even with a large family to support, Pellegrino had money enough in the early 70’s to spend—or invest—in a new project that was an extension of his love of the alternative culture and its music. Producer and Director June Pyskacek established Kingston Mines Theater as a home for her troupe of actors in 1969 at 2356 N. Lincoln Avenue, a former trolley barn. Lincoln was then a somewhat run-down commercial stretch dotted by dusty neighborhood taverns and empty storefronts. But it was a natural—and then much cheaper extension of Old Town to the south where rents were skyrocketing and the neighborhood gentrifying. It was already becoming ground zero for a vibrant new Chicago off Loop theater scene that was putting on cutting edge performances in store fronts and loft spaces. Above the Oxford Pub, a pioneer of outpost of trendy pub style watering holes, the street experimental jazz composer William Russo and his Chicago Free Theater staged The Civil War: A Rock Cantata in front of audiences that lined up around the block for admittance through an ally door every Friday and Saturday in 1968. Down the block in a space dubbed the Body Politic the nonprofit Community Arts Foundation and its director, the Rev. James A. Shiflett had just opened up with a production Ovid by Paul Stills’ Story Theater. In 1972 it premiered the imaginative and dazzling space opera serial Warp! by Stuart Gordon’s Organic Theater. Chef Louis Szathmary’s restaurant, The Bakery, was already a culinary tradition in a cramped storefront on the other end of the block. At Belden and Lincoln John Barleycorn’s woody recesses with its recorded classical music and slides of art masterpieces projected on screens attracted medical staff from near-by Children’s and Augusta Hospitals was well as the well-heeled denizens of the already gentrified of three flats that stretched east to the wall of Lake Front apartments in the Lincoln Park neighborhood. Both drew potential customers to the new theater scene. Other artists were taking advantage of still inexpensive rents. Artist Tony Fitzpatrick had a storefront studio. Displaced Wells Street hippies were beginning to hang out among the old Germans and after-work factory trade at Johnny Weise’s stripped down and basic saloon. At her new theater Pyskacek began to draw an audience. She leased out the front of the building to an eatery operated by Harry Hoch called the Kingston Mines Company Store that operated with the Kingston Mines name. But the plucky little theater company struggled to match the success of the shows across the street. Then they literally struck gold with a little original musical that they staged for less than $200. 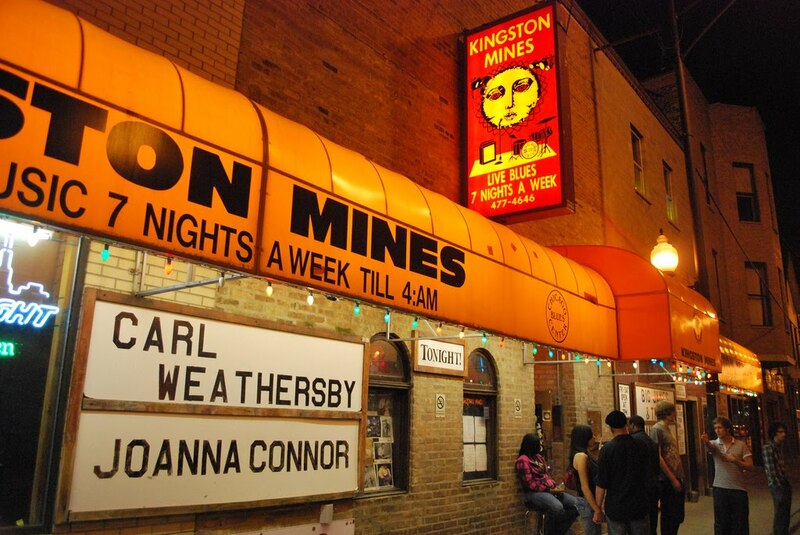 The original production of Grease put Kingston Mines on Chicago's cultural map. 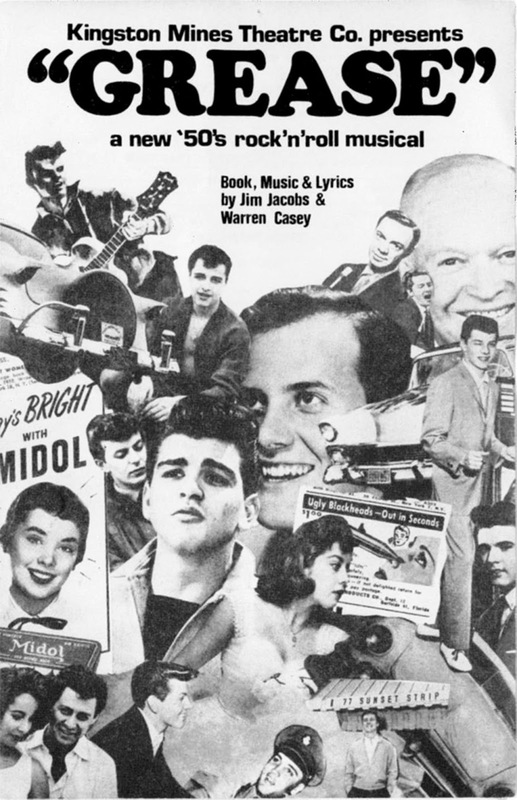 Grease was based on the memories of co-creator Jim Jacobs experiences at Northside Taft High School in the late 1950’s. It was honest, raw, often raunchy and loads of fun. Audiences loved it and it ran to packed houses from February to August 1971. It caught the attention of New York producers who sanitized the show to fit the rosy image of the era by now middle age nostalgic adults and had the creators largely re-wright the songs to make them catchier and opened it off-Broadway. Then it jumped to the Great White Way where it kept moving to successively larger theaters to meet audience demand. The rest, as they say, was show biz history. However much money the little show eventually made, it eventually doomed Pyskacek’s ensemble troupe. Although the cast was replaced for the New York runs, some members like Marilu Henner went to New York or tried their hands in Hollywood. Other got cast in shows at more prestigious Chicago theaters. Worse, subsequent productions never matched built-up audience expectations of the theater. By 1973 the troupe officially disbanded and Pyskacek was looking for a buyer for her now white elephant property. Dr. Len Pellegrino was the answer to her prayers. Pellegrino never intended to operate a theater—or a simple diner. He wanted a counter cultural gathering spot and a hip music venue. In addition to the building, he bought the restaurant, which was a separate legal entity. He was quite content, however to continue to use the Kingston Mines name, which had a certain cachet. Somewhat astonishingly given his reputation as a radical menace and iffy relationship with Chicago authorities, he was able to get a liquor license and open the doors of his new establishment under the new name The Kingston Mines Café. His joint filled a critical niche on the emerging Lincoln Avenue strip which had now stretched as far north as Wrightwood and was semi-officially the new Old Town—the vibrant core of the city’s hip street life. Most of the bars and clubs on the strip who booked music were featuring singer/songwriters as the Chicago folk scene continued to boom. Especially prominent was Somebody Else’s Troubles owned by Earl Pionke and local music legends Steve Goodman and Fred Holstein. After that closed Holstein and his brother Ed opened the self named joint in a space formerly occupied by the hippie Feed Store and hip capitalist Ratso’s. On the same block Orphan’s had a listening room that featured a mix bag of folk acts, a little jazz, and cabaret acts. Up on Wrightwood the radical collective that ran the non-alcoholic vegetarian eatery and community center Alice’s Revisited in a building where the Seed now had its offices on the second floor occasionally booked local bands and blues acts. Muddy Waters, who was still working a day job to support his family would sometimes gig there on basket house terms. The IWW Hall, occupying a former second floor bowling alley right across the street from the Biograph Theater, usually hosted benefit shows featuring local rock bands once or twice a month. B.L.U.E.S had opened on Halstead half a block north of Fullerton and was the first North Side club to regularly feature Black South Side blues acts. But there was no regular rock venue on the strip. Pellegrino booked the best and most progressive local rock acts on his stage along with occasional blues performers, white acts like the Siegel–Schwall Band and Black South siders. Doc was often on hand and a familiar and popular figure, but was not as flamboyant as Pionke, who was often kind of a show himself. He staffed the place with family members, old Doc Gandalf hands, and Lincoln Ave. street freaks. A tiny kitchen offered limited pub fare but the main attraction was loud music and a celebratory party atmosphere. I have fond memories of the joint as it was in those days, even though I was mostly a folk fan. 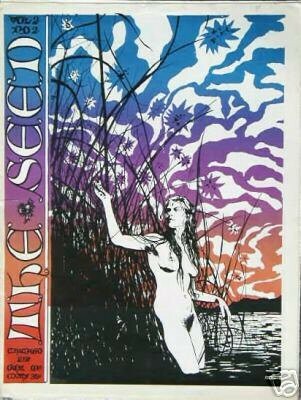 I conjure a memory of one particularly steamy summer night with huge but euphoric crowd bathed in sweat bopping to earsplitting music followed by an after closing expedition to the legendary Checker Board Lounge on the South Side with pals from the Seed and Underground Radio. After nearly ten successful years on Lincoln, the building was gutted by a devastating fire in 1982. Rather than go out of business or wait to rebuild in the shell of the old trolley barn, Pellegrino opted to relocate, expand, and reinvent the club. By this time the progressive scene in Chicago was rapidly giving way to the rise of punk rock which was attracting young crowds at new venues in the area such as the original location of Exit and Club 950 which occupied the space of the former Alice’s Revisited. But Pellegrino had little interest in the sound and was distressed that it attracted some skin head racists in addition to rebellious kids with Mohawks and piercings. At the same time, the South Side blues scene faced an aging audience and the rise of hip hop and rap. Some of the old clubs had already closed and others faced unsure futures. Kingston Mines on Haltead Street in it incarnation as a blues club advertising two of their most regular performers. Latter in 1983 Pellegrino re-opened Kingston Mines in a double store front at near-by 2548 N. Halsted, directly across the street from B.L.U.E.S. with an all-blues format. This is the incarnation of the Kingston Mines that now boasts of being the oldest, largest, and most popular blues club in the city. Rather than driving the older club out of business, the two places, along with recently opened Lilly’s on Lincoln formed kind of a destination blues district. Compared to the somewhat dingy digs at the old location, the new Mines was marked with a bright yellow illuminated awning stretching across its wide front. The expansive space included two stages where two headline acts played every night until a 4 am closing. Doc booked a mix of blues artists and styles ranging from traditional Delta to South Side, to blues rockers. Legendary names like Koko Taylor, Carl Weathersby, Junior Wells, and Magic Slim regularly graced the stage. From the beginning blues fans loved the place. Not only did the joint jump with virtual continuous music from the two stages, the atmosphere was friendly and fun. Doc’s motto was proudly emblazoned, “Hear Blues. Drink Booze. Talk Loud. You’re Among Friends.” He moved to an apartment upstairs and frequently mixed with his customers even as his family took over more and more of the day to day management of the club. Pellegrino gradually retired from the active practice of medicine and his volunteer service at the clinics, although he remained active as resource person and healthcare advocate. In 2008 the Mines hosted an awards dinner for one the organizations he supported, Pathfinders Prevention Education Fund which provides HIV/AIDS prevention education, counseling, and training principally for African-Americans on the West Side and near-western suburbs. He was one of the civil rights and medical service pioneers honored with an award that night, and perhaps the most beloved. Dr. Pellegrino acknowledging his award from the Pathfinder Prevention Education Fund at Kingston Mines in 2008. In the more than 35 years since the Kingston Mines re-opened as a blues club, all sorts of hip music venues featuring the latest sounds have come and gone. Many become overnight sensations and have vanished within 5 years. But the Mines has never gone out of style and is has remained a destination spot for hard-core local blues fans and tourists seeking the real deal alike. It was named the Chicago Reader’s 2016 Best Blues Club, the Chicago Music Awards 2016 Most Popular Blues Club, and the 2016 Torch Bearer of Blues in Chicago, and those were just recent honors in a long string of similar accolades. 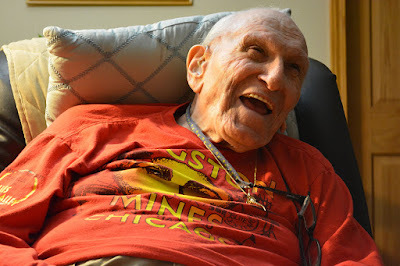 As Doc grew older and frailer he continued to come down to the club in his wheel chair on occasion greeting and chatting with patrons who have been coming for decades and first timers alike. They were all friends to him. Visitation was at a suburban Hinsdale funeral home on Wednesday and internment will be private. A memorial celebration will be held at the Mines at 6 pm, Tuesday May 15. 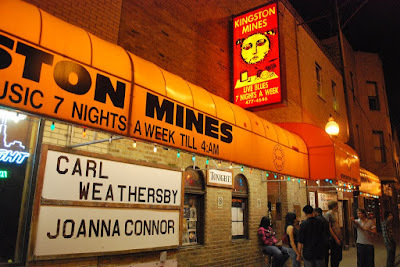 Then that Friday and Saturday night the Kingston Mines will celebrate the 50th anniversary of its origins as June Pyskacek’s theater with performances by Joanna Connor, Vance Kelly, and Larry McCray. Doc would approve. Thanks, Patrick, really enjoyed this read..Get over to the Mines on the 15th? Thanks. Unfortunately I work in Woodstock and can't get into the city early enough to make it. Wish I could. Oh yeah, I remember Doc Pellegrino and the Kingston Mines! I worked there as an entertainer, remember? I don't know what he paid his waiters and kitchen staff, but the singers got nothing but one free meal and tips. Remember the time the Wobs protested this, by picketing the Mines? Doc, his radical pride stung, came outside and handed out leaflets with the headline "I Am A Communist". A Chicago cop came swaggering up, saw our picket-line and demanded: "Who's your picket-captain?" Without a word, we all pointed to Doc. The cop grabbed one of his leaflets, read the headline, and that was enough. He hauled off Doc, while the picketers cheered. As I recall, we got really good tips that night. Very interesting. FWIW, Bonnie's last name is Koloc, and the Daley machine lacked the letter "I".